The euro op and eps really aren't that far off. Just a difference in the orientation of the trough/cut off is either bringing it up the coast or pushing it out to sea. Euro op does develop a storm. But as noted above, with the positively tilted trough, it kicks out. We've seen a lot of positively tilted troughs this year. 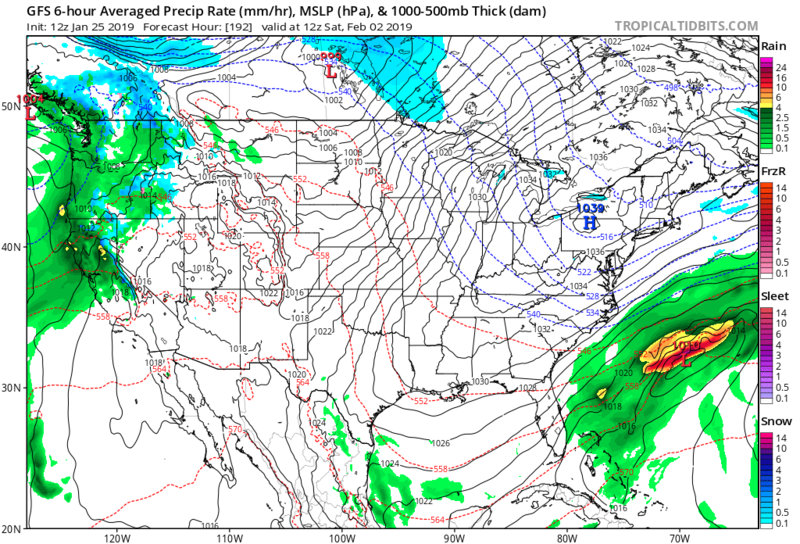 With all that rain in Delaware and SNJ the CMC was showing, I would love to see it kicked out. BTW those crazy totals the CMC was showing. The other storm showed those too and the storm went inland and brought the warmth and rain. One would wonder if a strong storm like this could actually do the same thing, bring in a lot of warmth rain and move inland especially if the trough isn’t that positively tilted. You gotta stop saying that everything went inland, because the truth of the matter is, it didnt. Last I saw the L was south of LI and heading ENE. Did it perhaps clip SE MA (not the cape - I don't consider the Cape inland). If it went over New Bedford/Taunton/Plymouth.... whether that's inland is debateable. When talking evacuating a hurricane, it is, but weather wise, I still think coastal. My unsolicited 2 cents is that storms have consistently favored inland snowfall versus coastal snowfall all season. Therefore, in my humble opinion, expecting this storm to be different is much closer to wishcasting than it is forecasting. Edit: maybe coastal locations end up getting rocked, but the odds are stacked against that occurring. Interests : Weather enthusiast, "Social Ruins" rock music! I wouldn't say they go away...but I would say that the NW trend is legit (to STL's point)...many storms, at least to me, this year have verified 100-200 miles (just a spitball number here) further NW compared to where they're modeled 7 days out. 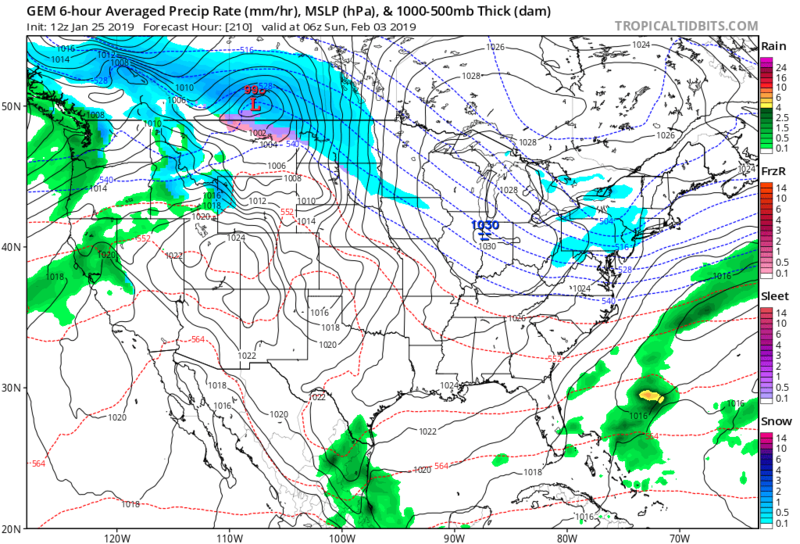 Normal times this is a good spot for the GFS to be placing a storm this far out. 200 mile shift NW may not help this one though. We will see how the storm evolves and the time frame as well, as the days pass. This is probably for long range thread, but the unrelenting Pacifc flow crashing into the west and the pacific flow flooding the conus shown on this map is crazy. Without that letting up, it is going to be very difficult to get a snow storm on the EC. Especially when there is just no blocking to hold these cold blasts in place. They come in for a couple days and then warms back up. We need a huge pattern change and not sure we are going to get it. 12Z ECMWF is forming a slow-moving monster just off the southeast CONUS coast. Snow for northern Florida, Georgia, South Carolina and North Carolina. Starts moving ENE out to sea on hour 222. Similar ideas on the FV3 and ECMWF on today´s 12Z runs. Wow two sub 980 storms on the Euro this run. Might be the first time this season. 12Z EURO Snowmap for this time frame. Congrats Columbia, SC & Augusta, GA. In Pennsylvania, the highest pressures are observed between September and November and the lowest pressures occurred between March and May. On average, pressures are ~3 mb higher during the fall than the spring and the most rapid drop in pressure occurs between January and March. This is just a long-winded way of saying the stronger storms being advertised have climatic support. This storm is over 10 days away, nobody knows where it is going.